Henley Rowing Club confirmed their place as the top Junior rowing club in the country with victory at the British Junior Rowing Championships. With a medal haul of five golds and one silver, the Henley Junior Women’s Squad dominated the girls events. In the WJ14 coxed quads, both the Henley A and B boats made it to the Sunday finals with ease. 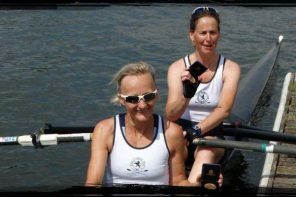 Over the 2000m course, the Henley A quad of Isabel Jonsson, Lottie Orr, Georgie Robinson Ranger, Ruby Brown and cox Gemma Sarney led from the front to win with an easy margin of over four lengths. The B quad of Maya Andrews, Amelia Fielding Smith, Tilly Lock, Charlotte Moss and Eve Poulter performed well to race into sixth position. In the WJ15 coxed quads, again both the Henley A and B crews progressed easily through their eliminator time trials and semi finals to race in their finals. Both Henley boats started quickly, the A crew of Ella Morgan, Clare Pearson, Lily Stimpson, Florence Wiggins and cox Rebecca Lister making significant headway against the 5 other crews to lead from the front from start to finish, taking the gold medal comfortably. The B crew of Katie Beale, Ella Wandless, Iona McNab, Anna Roe and cox Emma Lister then battled for the silver medal down the 2000m course. Into the final 500m, the B crew edged ahead of Lea Rowing Club to take the silver medal. The WJ16 quad of Lauren Edwards, Maddie Orr, Ellie Thompson and Hattie Orr again demonstrated their superior form in this age group, impressing the race commentators throughout the weekend. In the final, the quad led from the start, and commanded the final race to finish with clear water between them and the rest of the field. The WJ16 quad had also qualified for the Junior Women’s quad final earlier in the day. Having won the WJ16 event, they promptly turned around up the 200m course to race again in the Junior Women’s final. 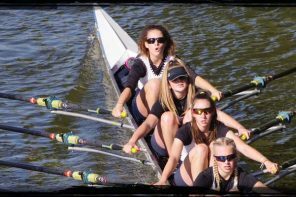 This second final proved to be a race to far for the Henley girls, having raced already through two semi-finals and one final that afternoon already, and they finished in fourth place. The WJ16 four of Lauren Kay, Georgia Edwards, Maisie Turner and Emma Lister had finished their repecharge in first place to make the final. 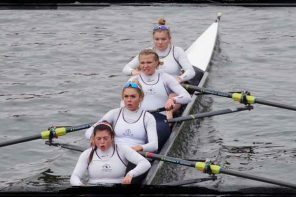 The Henley Women’s Regatta winners faced stiff competition in the final from Glasgow Academy and Queen Elizabeth High School crews, and in the race to the finish they competed with Bedford Girls School for the bronze medal,unfortunately losing out and finishing in fourth place. The most thrilling final of the Championships came from the Junior Women’s four. Having won their semi-final convincingly on the Saturday, the Henley crew of Ciara Buckley, Kryssie Steiger, Alexis Perkins and Emily Pimlott were racing against well respected Scottish crews from Aberdeen Schools and Glasgow Academy. 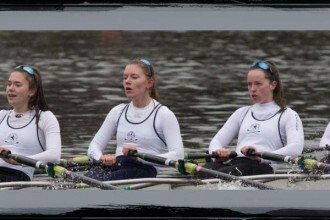 The Henley girls led through the race, until the final 500m when the Glasgow boat began their push for the finish. With 250m to go, the Glasgow boat rowed through the Henley girls, edging ahead. However, the Henley crew refused to relinquish the race and in a battle to the line, the Henley four managed to nudge ahead to win by a margin of 0.2 seconds. In the Junior Women’s eight event, the Henley crew was formed of a WJ16 rower and the WJ15 rowers that had won the WJ15 event at the National Schools Regatta earlier in the season. Racing against older girls, they knew that they had a tough competition. The crew of Lauren Kay, Florence Wiggins, Lily Stimpson, Georgia Edwards, Hannah Gutteridge, Maisie Turner, Ella Morgan, Emma Lister and cox Rebecca Lister started well, and as the race developed they slowly edged through the field to take the lead by the half-way point. In the second half of the race, the Henley eight powered ahead, and commanded the race to finish in gold medal position. In other events, the J16 boys rowed in single sculls. Harry Farley and Alexander Meyer-O’Kane reached the D final and came first and third respectively, whereas Alasdair Roy reached the A final, finishing sixth. Matt Harris performed well in the initial time trials of 48 scullers, but failed to make it through this eliminator round. Leon Redman, racing in the J18 single sculls, came 11th in the time trial eliminator round, and finished sixth in the subsequent semi-finals. Ed Dean also participated in the time trials, but missed out on a place into the semi-finals. The WJ15 single scullers Katy Claridge, Hannah Gutteridge and Alicia Redman progressed through the time trials to reach the C and E finals. Due to poor weather on the Saturday afternoon, these finals were cancelled.